With its partner of many years, Cassidian Optronics, HUBER+SUHNER is currently working on a new generation of state-of-the-art periscopes. The company's cables and connectors are now surfacing in submarines – in the true sense of the word. Naval forces often use submarines for reconnaissance missions, approaching a coast as stealthily as possible and observing the land or other ships through a periscope. For example, this allows submarines to stop weapons and drug smugglers in their tracks. During such operations, the periscope serves as the submarine's eye. This optical instrument is extended above the surface of the water while the submarine remains hidden below, enabling observation from a concealed position. The construction of a submarine periscope is extremely complex. The light is redirected by specially-arranged mirrors that deliver the image to the submarine cabin. A submarine periscope is also fitted with pressure bulkheads, a type of valve that prevents water penetration. Since it forms a connection between the inside and the outside, the periscope represents a weak point in the vessel, to the extent that almost 90% of the water that enters the submarine does so via the periscope. In addition to the lens, the periscope also contains various sensors, antennae and technology for automatic reconnaissance. Military submarines are usually equipped with two such systems: a search periscope and an attack periscope. The search periscope delivers a panoramic view of the submarine's surroundings and is used for longer oberservations. It can also locate enemy ships and features a satellite link, high image quality and a wide display window. As a result, it can take photographs from its field of vision and carry out surveillance in night vision mode with the help of an image intensifier. The attack periscope is much smaller and thus presents a narrower radar cross-section, which makes it more difficult to detect. This does, however, impose restrictions on the angle of view and image quality. The range of periscope functions is constantly increasing, which brings added technical challenges. HUBER+SUHNER is up to the task. 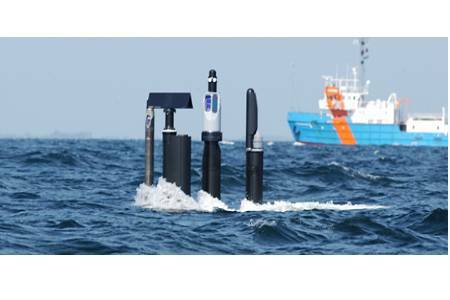 The company is developing a new generation of state-of-the-art periscopes in collaboration with Cassidian Optronics, a renowned manufacturer of optronic mast systems for submarines and partner to HUBER+SUHNER for 25 years. The project is being conducted as part of a contract with the German shipyard HDW, located in Kiel. The complex, customer-specific cables and connectors will be used in both search and attack periscopes. Connectivity solutions for periscopes must meet a multitude of requirements. The BMA connectors in the pressure bulkheads must be easy to install and replace, and be capable of withstanding 68 bar of pressure. The cables must also be pressure-resistant at 68 bar. Flexibility and diameter are equally important because of the limited space available, with a maximum diameter of 29 millimetres. Despite these restrictions, the cables must transmit error-free optical and electrical signals to exchange data and supply power. HUBER+SUHNER is deploying a hybrid cable that contains 4 fiber optic strands, 2 coaxial wires and 34 copper wires. This customer-specific solution represents a particular challenge because hundreds of metres of these types of cables are usually produced at a stretch but, in this case, the longest cable measures only 15 metres. This necessitates a complex production process in small stages. A hollow conductor must even be built into the hybrid cable for the coaxial wire to be subsequently fed through, however thanks to its expertise in radio frequency, fiber optics and low frequency, HUBER+SUHNER is able to provide Cassidian with the solution from a single source. A total of approximately 200 metres of hybrid cable have been supplied so far; the pressure tests are currently in progress. As soon as the trial runs have been completed successfully, Cassidian will deliver the next-generation periscope to the Columbian Navy. The Navy is hoping to replace all the periscopes in its current submarine fleet as part of an initiative to overhaul and modernise its equipment. The periscope system from Cassidian Optronics was chosen because the modern, cost-effective and ready-to-install modular solution enables older periscopes to be replaced without requiring substantial modification of the submarine.